There is a long list of treats that we typically only enjoy during the Christmas holidays. Gingerbread, candy canes, fruitcake, pumpkin pie, perhaps a yule log cake—and maybe your family has a specialty all its own. Most of these desserts can be translated into ice cream form with delightful results, and the topic of this post is no exception! Egg nog ice cream takes a holiday favorite to a whole new level. When drinking regular egg nog, you might very well imagine that it would be great in ice cream form. But it can be rather difficult to actually make egg nog ice cream, keeping all the ingredients in the correct proportions and textures. We’ve got you covered, though; just visit our website for two equally delicious recipes and take your pick. Each one will create a delicious frozen dessert with a variety of creative serving ideas. 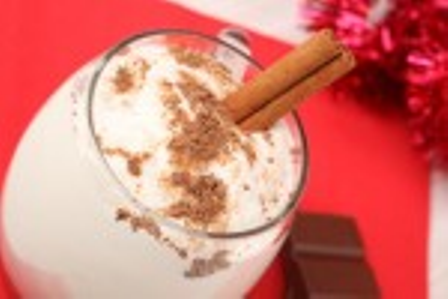 Our recipes use some creative approaches to duplicate the flavor of egg nog. For one thing, imitation rum extract adds the signature flavor of egg nog without the alcoholic content. The real trick, though, is getting the egg into your egg nog ice cream without changing its texture. The secret ingredient? A powdered egg substitute. The Philadelphia style recipe will end up packing less calories on, but the custard style recipe will result in a more “authentic” egg nog texture. You can certainly leave alcohol out of your egg nog if you choose, but there’s one thing you can’t change: it has to be made and served cold! This makes it a perfect candidate for ice cream treatment. Make this year’s Christmas party a little different by serving egg nog ice cream, perhaps accompanied by some of those other great seasonal desserts: gingerbread cookies or a big slice of pumpkin pie.